Are you performing due diligence on MEC Electronics Entwicklung in Vienna from Austria who sells IC? If so, read on below to read one buyers experience when trying to buy IC. You will also find some links to help you find more related information about MEC Electronics Entwicklung in Vienna on Supplier Blacklist and on Google as well as other bad suppliers of IC reported here on SBL. MEC electronics Entwicklung Is fraud company!!! Please do not deal with MEC Electronics Entwicklung company. They are unethical in the way they conduct their business. Need More Info on MEC Electronics Entwicklung in Vienna? If you need more information, you can click the below links to search for more submissions about MEC Electronics Entwicklung in Vienna on Supplier Blacklist as well as go to the search results page on Google for more reviews online about this company. 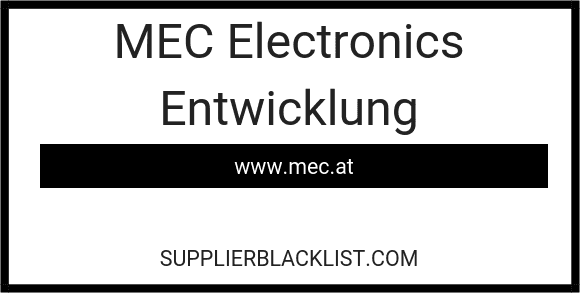 Perform a Supplier Blacklist search for more reviews on MEC Electronics Entwicklung in Vienna. Search Google for MEC Electronics Entwicklung in Vienna Reviews. MEC electronics neither sold to Afganisthan than sold ICs. Mostlike this post was from a chines supplier which was blacklisted on this webpage before from me. This listening is absolutaley incurrect and I hope supplierblacklist.com will remove it. We will also set legal actions against the author.